Personalize your onsite marketing campaigns with dynamic smart content to easily boost your engagement and conversions. Did you know that 75% of consumers are more likely to buy from a retailer that calls them by name? And that 63% of consumers find generic content so annoying that it affects how they perceive a brand? If you’re showing identical campaigns to everyone who visits your site, you’re likely annoying your visitors and missing out on conversions. Personalization is the best way to ensure your offers are always relevant. Wondering why website personalization matters? It’s simple: personalized content is proven to work. Companies that use personalization see significant increases in customer engagement, 20% more sales opportunities, and 18x more revenue according to studies by Jupiter Research and Annuitas Group. But if you’re researching how to improve website personalization, you’ve probably noticed that many website personalization tools don’t come cheap. Enterprise-level personalization software can give big conversion boosts, but what about smaller businesses who can’t afford to invest thousands a month in these tools? 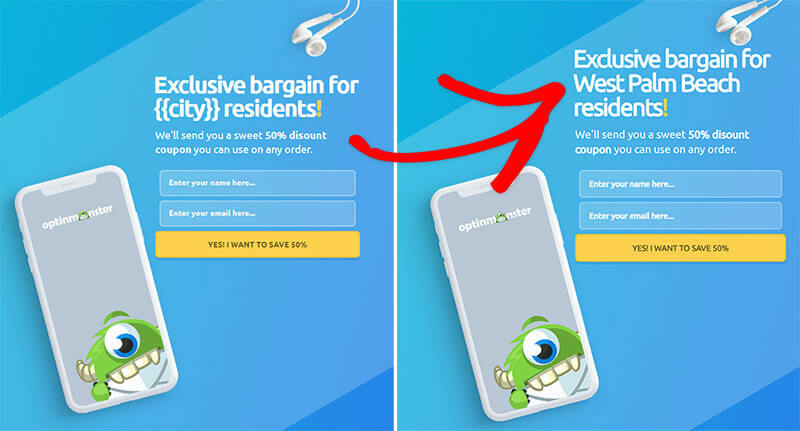 With OptinMonster’s Smart Tags feature, using smart dynamic content in your onsite marketing campaigns is easier and more affordable than ever, for any size business. OptinMonster’s Smart Tags feature allows you to place dynamic content in your onsite marketing campaigns with the click of a mouse. If you’ve ever used merge tags in email, then you’re already familiar with just how easy and useful Smart Tags can be. Using our simple drag-and-drop builder, you can add all kinds of merge tags: date or day of the week; city, state, zip code or country; and any information the visitor submits including their name, email, or phone number. Advanced users can even create their own custom Smart Tags, by integrating with your email service provider or CRM software to display any data you have stored on your subscribers and customers (name, interests, previously purchased products, etc.). The importance of personalization in eCommerce can’t be overstated – according to Accenture’s Strategy Global Consumer Pulse Research report, businesses lose billions of dollars every year because of poor personalization. With OptinMonster’s Smart Tags, you can grab the attention of shoppers by addressing them by name, or displaying the name of their city. Click here to see another example of Smart Tags in action! One highly effective use for Smart Tags is to reduce shopping cart abandonment. More than 66% of people who put an item in their online shopping carts never complete the purchase, which means eCommerce retailers are losing a LOT of money. Smart Tags capture the attention of those abandoning shoppers by displaying exclusive, relevant deals that are personally targeted just to them. Combine Dynamic Text Replacement with Exit-Intent Technology, Page-Level Targeting, and Geo-Location Targeting to convert even more abandoning visitors into customers. Bloggers and media companies need visitors to stay and engage with their content in order to turn a profit, but today their attention spans are shorter than ever. OptinMonster’s Smart Tags can help you retain your audience’s attention and improve engagement with your content by displaying the right content to the right person at the right time. Smart Tags let you tailor offers to your audience depending on the day, date, physical location, content they’re viewing, and more. This content personalization feature will help reduce your bounce rate and boost your engagement metrics by creating personalized marketing campaigns tailored for each visitor. Ready to increase ROI on your website with personalized marketing campaigns? Get started with OptinMonster today.